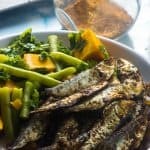 Crispy oven baked sprats – Tiny sprats generously seasoned with my very own homemade all purpose seasoning and baked to a golden crisp. Calling all seafood and fish lovers, this is a roll call for my avid fish fans because you will love this new dish that I created featuring sprats. 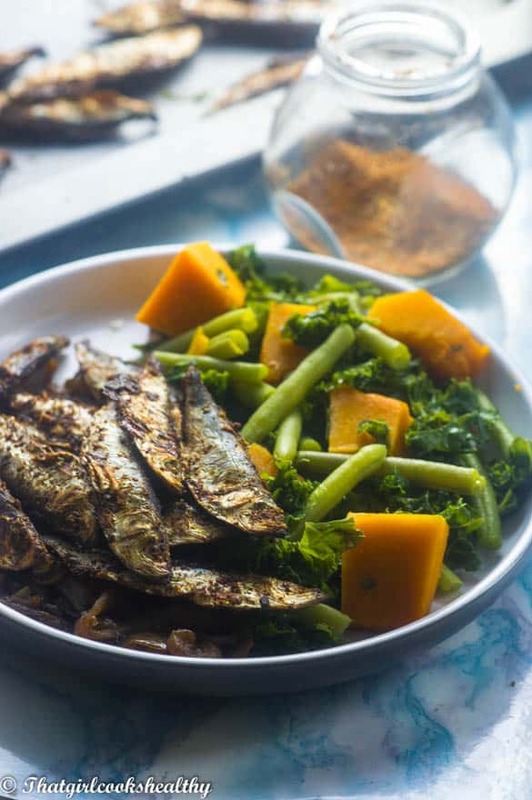 Now sprats are the least popular oil enriched fish, but over the last few years, sprats are beginning to gain some recognition. Before I delve into this super duper easy recipe to hand, first let me tell what a sprat is. Sprats are very small, long in length and quite thin in size. The fish comes from the European sea region and is available whole, salted or canned. You can also purchase them fresh or frozen. If you’re partial to fresh fish then you can purchase in season between August to February. My grandmother was the person who first introduced these miniature fish to me. I remember seeing her come home from the market with large quantities of exotic fish, most of which she would freeze and thaw out to add to soup or steam with some Caribbean root vegetables. One thing that made me squeamish was when she’d gut the fish, nowadays you can get the fishmonger to do it but my grandmother specifically wanted me to learn how to gut a fish using her method so she would buy the fish uncut and show me how to do it. Although sprats vary in size – small to medium, their petite nature makes them much more easier to clean. Interestingly, you won’t find them gutted at the fishmonger because it’s such a tedicious task plus, as mentioned, you can do it yourself. It’s not difficult I can promise you that and I hate cleaning fish. I will warn you that it can be quite time consuming but only if you cook a large quantity of fish. I usually buy a 500-1kg worth of sprats then gut, prep and bake the amount that I am going to consume each time. If you cannot get hold of any sprats use another small fish such as sardines or whitebait as an alternative. The fish is very easy to prepare using my homemade all purpose seasoning. Be generous with seasoning the fish, I don’t usually measure, just sprinkle and massage everything in. At a guess I use somewhere between 1-2 heaped tablespoons. 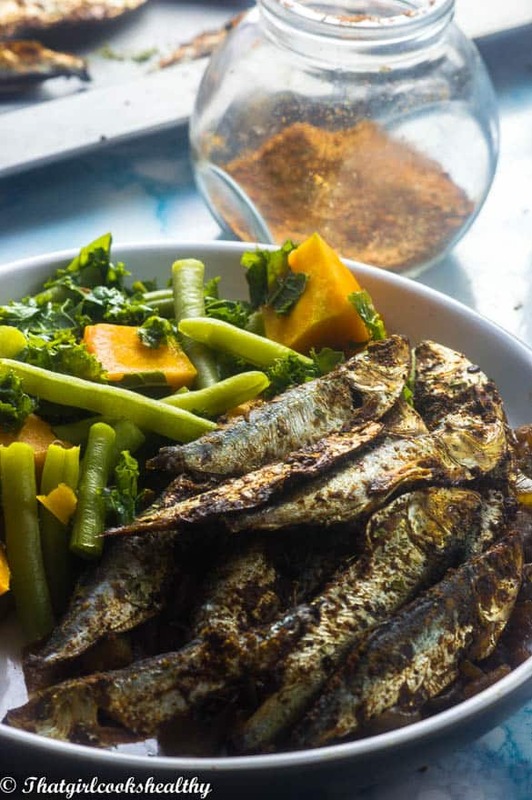 No oil is required as the sprats are generally quite oily and bake nicely in their own omega fatty oils. Pre heat oven at 180c and line a tray with parchment paper. Place the sprats in a colander and squeeze fresh lime over the fish. Use your hands to massage/coat the fish with the lime then run cold water over the colander to rinse off the lime then thoroughly pat dry with a paper towel. Use a knife to gut the fish, to gut the fish, make an incision in the belly and cut from the tail end to the head of the fish. Use the knife to scrap out the guts and gently pull to remove the bones, if it breaks, just remove in two parts. Rinse one more time to ensure all the insides have been completely removed and dry with a paper towel. Make sure the fish are thoroughly dry as they won’t crisp well if wet. Transfer the sprats to a large bowl then sprinkle the all purpose seasoning in, how much seasoning is your discretion. I used approximately 1 tbsp and a small amount of excess. Just make sure all the sprats are coated well. Lay the sprats onto the baking tray in a single layer, don’t overcrowd. 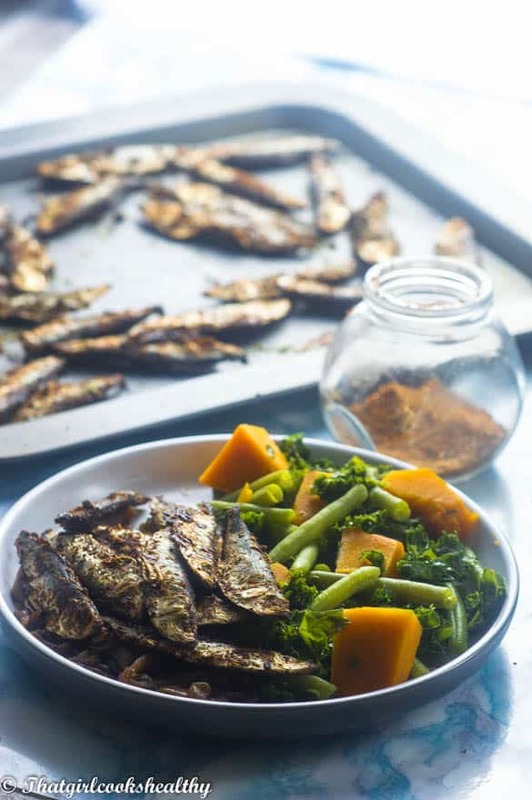 Bake sprats in the oven for 40-45 minutes, check frequently to ensure they don’t burn, they should to dark and crisp to the touch. Thank you, as a Francophile living in France for 25 years, today I came across a fishmonger selling ‘Spats Fumè’. As I originate from London, working in the East End and also at Hastings on the South Coast, I used to eat thousands of these little critters. This is the first time for me in France and as time has passed by I found your recipe on the net to remind me how to prepare the Spats. I found it so useful. From one sprat lover to another many thanks for your comments. Glad you found the recipe useful.